New Club World food service photos …. with Bollinger?! A reader sent me a link to a Flickr album (yes, it still exists!) he created featuring some photographs of the new Club World food service found on Instagram. For copyright reasons I have not published the pictures, but you can see them on Flickr here. The pictures on this page are from the BA ‘investing4u’ press day that Anika attended over Easter, where a taster of the new service was previewed. The images were apparently taken during a demonstration at the BA headquarters building at Waterside. The most shocking thing here is that there is a bottle of Bollinger in the ice bucket. Is BA seriously going to start serving this in Club World? For a business that got excited by the prospect of saving £1 by removing a flower from the First Class toilets, it seems unlikely …..! The presentation looks excellent. Someone has clearly realised that attractive crockery is not necessarily more expensive than ugly crockery (so can we have some prettier mugs in Club Europe please?). Of course, none of this will make much difference if there isn’t a step change in the quality of food and substantial care and attention taken to how it is cooked and prepared. We will know soon enough, with the new service due to be launched on the Heathrow to JFK route next month. Other routes will need to wait until 2018. Take a look at Flickr and see what you think. Thanks to the person who sent this over. Champagne is another of those classic North-South divide issues. I like champagne and caviar but I am happier with cava or prosecco and a dollop of taramasalata. I suspect the nearness of France and the propensity to be pretentious corrupts the South. I never understood why we were taught French at school when Spanish is more spoken and Spain several hours nearer to the North of England. Harry, I think he’s implying that people in the north know how to fly to Spain but can’t find France except by road. Except that you can now get a RFS from Manchester to Nice, so the roof box can go into storage! Perhaps if all you can fly to from your local airport is a Spanish bucket and spade route? Not all people are the same. Perhaps I’ve been in the south too long. “More LPGS sir?” Saying that, still love a chip butty! If someone from elsewhere in England is going to pretend to be from the north and write something which makes fun of us, you’ll have to be more subtle than this. We don’t really have chips this big on our shoulders and do travel worldwide, thanks. I remember my first go at trolling too. Please sir! Any courses in bilge and drivel ? Maybe some decent non alcoholic drinks wouldn’t go amiss too. Not everyone is into the booze…. +1. Having been on the wagon for several years now, some fancy soft drinks would be appreciated in premium classes. The QR non-alcoholic champagne is very good (and £27 off the shelf). It’s really nice. The mocktails on QR are also really tasty. When I fly QR I actually drink a bunch of non-alcoholic drinks in between the usual Champagne as they’re so good. BA would be good to offer more tasty non-alcoholic drinks. The So Jennie on QR is nice too! I still don’t understand why they need to serve from a trolley rather than restaurant style, as many airlines do. Probably because they fit more seats into a J cabin than some other airlines and want the meal service to be over with more quickly and with fewer (or at least not more) staff. It’s a shame they don’t charge less than other airlines then, if they are operating such a low-cost model! I love trolley service, you get it on Cathay Pacific into china, really nice touch. I’m possibly the only one who thinks it but CW for me is already superior to virgin upper class. I still cannot get over any business class seat which needs to flip over to become a bed, as such it’s impossible to lounge half way. It’s because the WOW! factor of what’s coming to a halt next to each to each passenger is enough to make them pause their movie or whatever and give the crew their full attention for a couple of minutes. And believe me; I did my new CW course recently and there’s no doubt whatsoever that the whole new offering – from cutlery, crockery, glasses, food, presentation, service style – is going to be a game-changer for BA. There were eighteen Worldwide crew (the oldsters!) per course and not one of us could muster anything but high praise for what has been designed & executed. It will force you to take your headphones off when it pulls up alongside your seat. And they’re just the starters! I have seen this in Lufty First and I agree it works well. We need to be honest though, it is only papering over the cracks in Club World. Most people would take the new Qatar QSuite with a bag of crisps for a meal rather than CW with this new food service. True, but strong rumours on the FT thread that BA have ditched their enhanced version of the current CW setup and are launching a similar version of the QR Q suite. That is …. the old QR seat which QR is now ditching for the QSuite! Why would you want to be forced to take of your headphones and give the crew your full attention. I want my crew to be attentive but discrete – I don’t need anymore friends so am happy to have my ordered food, presented to me, I give a nod of thanks and continue watching the movie! “A game changer” sorry but it will take a great deal more than an improvement in catering to get me back on board. BA is simply “bloody awful” and its anyone except BA. Currently in the middle of a 4 sector CX trip and the difference between BA and CX is chalk and cheese. BA can’t hold s candle to them. I also did a 6 sector trip on AA in July both international and domestic and again BA left well behind. My one and only experience of Qatar is one of my stand out flight experiences ever. From departure to arrival simply superb. Happy to pay a premium over BA to fly with them again. Let’s wait and see as to whether the quality improves or this is just another poorly disguised efficiency drive by BA. Meantime, the big issues remain – almost every BA flight I have taken recently has had delays, it continues to be hugely obvious as to when you have a mixed fleet cabin crew versus old school long haul (way better), premium boarding lines are longer than economy at the gate, gate area is often just a huge disorganised crowd of people etc. Flight delays can sometimes be great! Our flight back from LA last month was delayed by 5 hours. We knew about the delay (to the incoming flight) when we woke up in the morning, so we were not inconvenienced in any way. And the £1076 compensation (more than we paid in fees and charges for this Avios redemption flight) was paid 4 weeks later. Cheap champagne never tasted so good! Having commented unfavourably about CW in the past, I was also really impressed with the flights. The food was excellent, and sitting facing each other with the divider down during the meal made the experience so much more enjoyable. The abundance of empty seats also helped. I would still choose AA if I was paying cash, but for a 241 exemption, Avios collection is a worthwhile hobby. Thanks Rob (and everyone else who posts advice here). This site made it all possible. The first picture looks like they’ve just plated the meals in the galley then brought them through for dispersion on the trolley. Not the same as Luft first. Spot on re: Club Europe mugs – look like they belong in a motorway service station rather than at the front of a ‘premium’ airline! Also, the coffee stinks. I’m a coffee snob but the pervious instant was better than the fresh bags they currently use. A very nice crew member poped two in the pot for me last time and it was still horribly weak! BA are not alone in misleading PR. Virgin do the same on their Ruby blog where pictures of the on-board bar feature Lanson champagne when there’s not been any Lanson on board for years, only the ghastly Gardet. The Gardet has gone! I can’t remember the name of the new brand but it was miles better than the Gardet! Pretty sure it’s Perrier-Jouet now. Had to move seats on a flight back from Atlanta in UC so wife and I were split up – cabin crew gave us a bottle along with some boxes of chocolates from the duty free as an apology for the hassle. Very decent of them and very decent stuff to drink! You can do it, but you will end up with 2 separate bookings. You + 1 kid and hubby + 1 kid. This makes absolutely no difference to anything EXCEPT seat selection. If your husband is Silver or Gold with BA then he will be able to select seats for free for himself and the child on his booking whilst you cannot. Apart from that, having the four of you across 2 separate tickets makes no difference. You can book for four but you will have two separate PNRs. Each of you and your husband need the vouchers (you can’t add a voucher to a booking at a later date). If Gold can then link the PNRs. Have I not read somewhere that if in Household account then you can use 2 vouchers for 1 booking for 4 passengers? Having 2 different PNRs is not only about seating but also about keeping you as one group in case of re-routing, overbooking etc (I know that it is unlikely, but if it happens then consequence can be quite serious – let’s say there is an overbooking and BA wants to remove 2 passengers and here you are with your child while your spouse and another child on separate PNR are allowed to board…). Yes, did this last year – household account and used one 241 of mine and one of my wife’s to book 4 people (+ one infant) on the one PNR. Had to call to do it, but no problem. Don’t think so. You can use 2 x 241’s in one booking if they are both in the same name. These can happen with the BAPP card because the voucher lasts 2 years and so you can easily have 2 of them. Thanks for the comments, much appreciated. Is there an article on using two 241″s or have I missed it? It would be great to have the most up to date info or HFP readers experiences on using them. Wouldn’t even be discussing this in the first place if it wasn’t for this site so thanks Rob and contributors. There isn’t anything different about it. If one person has 2 vouchers then you can book all 4 people on one ticket. If the vouchers are in different names then it requires 2 bookings, but it is the same process as using one voucher. We regularly travel on 2 bookings as my wife has her own BAPP card and it has never been an issue. Yep, try a different agent – see T&Cs posted by Andrew* below. “That is not possible” seems to be the standard response to anything you ask a foreign call centre operator in my experience. I will only contact the UK based call centre now as I can have a conversation with them without losing the will to live! Doesn’t the person who ‘owns’ the 241 voucher have to be one of the travellers? How could one person who ‘owns’ 2 x 241 vouchers use that to travel with 3 others? If the Cardmember has two valid Companion Vouchers on their account they have the option to redeem both of them together for one flight booking allowing the Cardmember to travel with 3 companions and pay the Avios flight price for only 2 people travelling on the booking. Looks as if the Bolly bucket is on a patio rather than in CW…. Sorry O/T re HHA – If I have a HHA on BA.com and separate accounts on avios.com, can I still use combine my avios on avios.com to transfer to my individual BA accounts? 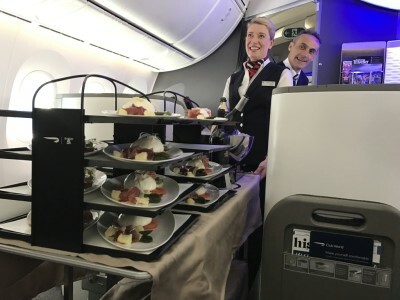 Looks promising – but it would be good if they actually loaded the meals onto the aircraft in the first place. 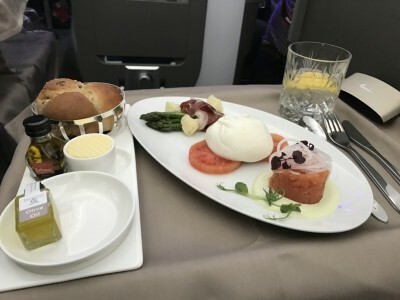 It seems normal now that CE doesn’t routinely load sufficient catering for every passenger to have a meal; in my last 16+ F segments I’ve yet to have a full meal service with every course loaded, the full wine list available, and menu options all actually available! OT why is it that invariably I price PE tickets on BA but then when I go to pay and upgrade to CW using avios the price is always substantially more for the same flights. Money grabbing ploy or something I’m doing wrong? Potentially additional fuel surcharge going on. You might find the issue isn’t related to upgrading – the site is shocking at pricing tickets until you get to the confirmation stage. I know who posted them, but they are still copyright ….